0 plants cultivated by members of ORCHIDS.ORG. 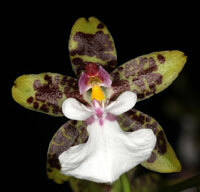 Oncidium leucochilum is an orchid species identified by Bateman ex Lindl. in 1837. ORIGIN: This species is a large sized, cool growing epiphyte found on trees in dry or humid forests up to an elevation of 2000 meters from Mexico, Guatemala and Honduras. DESCRIPTION: This species is a large sized, cool growing epiphyte found on trees in dry or humid forests up to an elevation of 2000 meters from Mexico, Guatemala and Honduras with ovoid to ovoid ellipsoid, compressed, 2 to 3 ribbed on each side pseudobulbs subtended by several scarious sheaths and carrying 2, apical, ligulate, coriaceous, conduplicate at the base, obtuse leaves that blooms sometime in the spring through fall only once with an axillary, 1 to 12' [30 to 360 cm] long, many flowered panicle arising on a mature pseudobulb from the axils of the sheath with 7 to 10, well spaced branches with 2 to 5, variable sized, waxy, longlasting, spicely fragrant flowers each. FLOWER SIZE: 1 1/4 inch [3 cm] -- information provided by Jay Pfahl, author of the Internet Orchid Species Encyclopedia (IOSPE).